Pay only $748 when you pay in full! As a business owner, your work goes far beyond planning and décor. To succeed in the industry, you need to be business savvy to effectively market yourself, network with vendors, and manage the back end of your business. QC’s Accelerate Your Business Workshop gives you the tools you need to bring your event and wedding planning business to the next level. Learn about branding, social media, content marketing, search engine optimization and other advanced marketing tools. Your workshop includes additional optional units on business communications, project management and financial management, allowing you to target the aspects of business ownership you need to succeed. You’ll work one-on-one with your tutor to complete a personalized development project that targets your unique business needs. During a one-on-one Skype call, you’ll discuss your business plan in-depth to evaluate the most important steps to take. With guidance from experienced and successful business owners, you’ll have the knowledge to build a solid foundation for your career. Invest in your business to gain clients and connections, manage your work effectively, and create a more profitable future. Prerequisites: Students must own a business in the event industry. Once a QC Event School student herself, Athena has made a name for herself as a leading Dallas wedding and event planner. 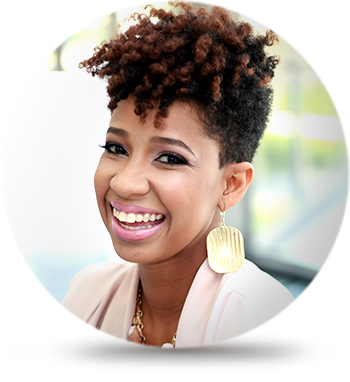 The rapid success and growth of Coalesce Creations is a testament to her expertise as a planner and as a business owner. She channels her talents for creativity, design and networking into every aspect of her work and approaches her business with passion and dedication. As a tutor, Athena is eager to help new event planners achieve business success. Your business is unique, and so are your business needs. That’s why you have the option of completing a personalized Independent Development Project at the end of your course. Your tutor will get to know you and your business intimately. Then, she’ll create an advanced assignment covering an area of your business that you’d like to work on. You’ll set up an exclusive Skype session with your tutor for in-depth feedback on your work and learn where your business can go next. QC sends you everything you need to complete your course, including lesson texts, course guides, and video tutorials on DVDs. You’ll gain lifetime access to the Online Student Center where you can find electronic copies of your course materials. Here, you’ll submit assignments, connect with peers, review your tutor’s evaluation and audio feedback, and download customizable business forms and templates. Find out how you can identify your target market by developing customer personas to portray your clients. Learn how to find the “gap” in your market and keep your business operating in a competitive area. Understand the stages of the customer life cycle. Learn to plan and evaluate promotions to boost business prospects. Discover how to build an effective and user-friendly website for your business. Learn how to use Google Analytics to track your website traffic and build important reports. Explore ways that you can interact with your target audience and clients on social media. Find out how to leverage SEO to bring more qualified visitors to your website. Understand how to create useful content for your target audience, and how to share this content. Learn how to use MailChimp to develop email newsletters. Explore topics that you can bring to your blog to engage your audience. Find out how to set up a PPC campaign through Google Ads. Find out how you can create a professional portfolio to show clients and employers. Learn about the differences between print, digital, and video portfolios, as well as how you can manage photo and video permissions. Learn how to organize and execute a styled shoot to add to your portfolio. Discover ways that you can reach out to and network with other professionals, such as vendors and other planners. Learn how to write a professional email, how to write a proposal, and more. Explore strategies for resolving conflicts with clients. Learn the ways in which you can set up your office to stay organized and on-task. Discover the differences in managing single projects, such as weddings and corporate events. Study the various project management systems, such as the waterfall method and progress boards. Learn how to use the Gantt chart to manage projects. Discover strategies for managing multiple projects. Learn how to develop a marketing calendar and schedule for your event planning business. Learn the benefits of delegating tasks, and explore the types of project management software. Find out how to deal with burnouts as a business owner. Discover how to create a business budget. Understand cash flow statements, projects, profit and loss statements, and balance sheets. Explore various types of financial software. Learn how to collect payments from your clients. Complete your Independent Development Project Survey to define which area of business you would like to focus on in your personalized assignment. Receive one-on-one feedback form your tutor via Skype. Start planning your business’s future. 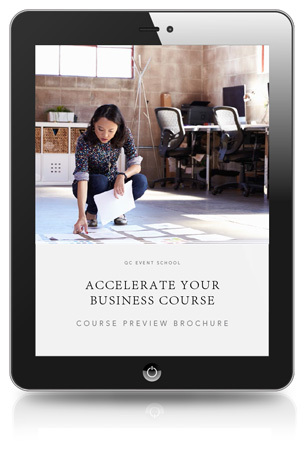 Download a Course Preview to get an inside look at the Accelerate Your Business course. Your passion for planning and professional motivation will lead you to a successful career path in the event and wedding industry. Enroll today to take the first step towards a better future—one where you run your own business. When you enroll with QC, you have dedicated support specialists to help you every step of the way – from first contact, to graduation, to your career in the industry. We are here to help you succeed. Have questions about this business workshop? Contact us!